Do you have a winning mug cake recipe using Perfect Size For One? 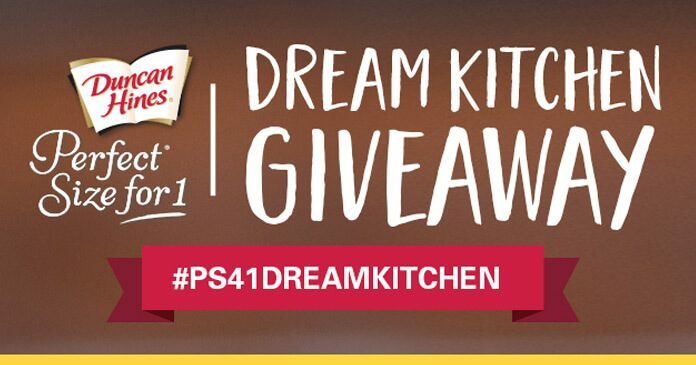 Go to duncanhines.com/ps41 and enter the Duncan Hines Dream Kitchen Giveaway for a chance to win the kitchen of your dreams. Plus, you could win Duncan Hines perfect size for one product samples. The Duncan Hines Perfect Size for One Dream Kitchen Contest is only open to legal residents of the 48 contiguous United States and the District of Columbia, who are at least 18 (except Alabama and Nebraska 19, and 21 in Mississippi) years of age or older at the time of Promotion registration. The Contest Period begins at 9:00:00 AM ET on August 15, 2017 and ends at 11:59:59 PM ET on October 6, 2017. Limit of up to 15 additional Sweepstakes Entries per person for the length of the Promotion Period. Limit of one Entry per person per email address, or Instagram or Twitter account, per day, throughout the Contest Entry Period. At the conclusion of the Contest Voting Period, the Contest Grand Prize Winner selection will be based on the votes that are received and begins at or about 9:00:00 AM ET on October 6, 2017 and ends on or about 8:59:59 AM ET on October 10, 2017. The Contest Grand Prize Winner will be announced on the Website on or about October 10, 2017. At the end of each week during the Contest Entry Period, the Administrator will conduct one random drawing from all eligible Sweepstakes Entries received up to the time of the drawing. During each Weekly Drawing 10 Weekly Sweepstakes Winners will be selected for a total of 50 Weekly Sweepstakes Winners. On or about October 7, 2017, the Administrator will conduct one random drawing from all eligible Sweepstakes Entries received during the Contest Voting Period and will select 500 Voting Sweepstakes Prize Winners. CONTEST GRAND PRIZE (1): One (1) Complete Kitchen Renovation. The Approximate Retail Value of the Contest Grand Prize is $10,000. CONTEST SECOND – FIFTH PLACE PRIZES (4): Eighteen (18) boxes of the Duncan Hines perfect size for one product. The ARV of each Contest Second – Fifth Place Prize is $45. WEEKLY SWEEPSTAKES PRIZES (50): One (1) box of the Duncan Hines Perfect Size for One product. The ARV of each Weekly Sweepstakes Prize is $2.50. VOTING SWEEPSTAKES PRIZES (500): One (1) packet of the Duncan Hines Perfect Size for One product. The ARV of each Voting Sweepstakes Prize is $1. The ARV of all Promotion Prizes is $10,805. To receive the list of winners of prizes, send a #10 self-addressed stamped envelope for receipt by October 31, 2017 to: Duncan Hines Perfect Size for One Dream Kitchen Contest Winners List Request, c/o Realtime Media, 200 Four Falls Corporate Center, Suite 100, Conshohocken, PA 19428.